This book is both hilarious and heartbreaking. 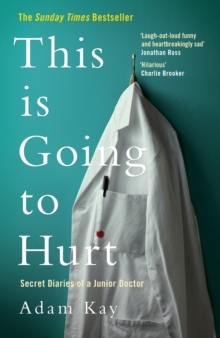 A timely plunge into the messy and courageous world of a doctor on the front lines of the NHS, Kay drags us through his chaotic days and nights. The dangerous demands of 97 hour working weeks, the power and pressure of saving lives, and the valiant attempt to have a life outside the hospital are laid bare. Kay tackles the popular myths about the lives of doctors, while revealing the truth of their daily lives and careers, the unpredictable patients and emergencies, and the endless stream of bodily fluids. Don’t read it while you’re eating, but do read it.